With over 700 million downloads, Apple’s iTunes U has been a massive success, but unlike other new online learning services like Udacity or Codecademy, it’s missing a social component where students can ask questions and learn from each other. Apple, Stanford University and the Palo Alto-based startup Piazza have now teamed up to bring Piazza’s social learning platform for students, TAs and professors to the next session of Stanford’s highly popular iOS development class on iTunes U. 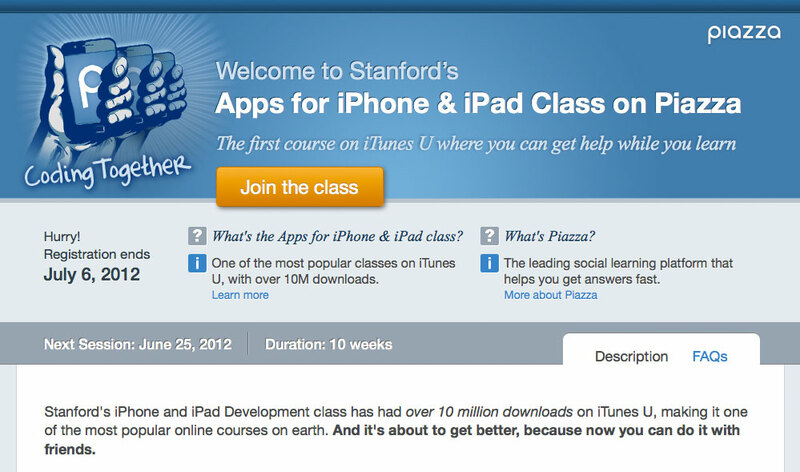 This is a first for iTunes U and Piazza and Stanford worked closely with Apple to get a link to the course’s Piazza site embedded in iTunes U. With Piazza, though, students can ask each other questions (both under their real name and anonymously) and discuss what’s happening in a class in real time and use a wiki-like site to edit responses. It’s important to stress that Piazza is more than just a message board. The service, for example, distinguishes between responses from students, which they can edit together, and responses from teachers, which they can also collaborate on. Students can also see how many of their classmates are online at the same time. So far, Piazza has raised about $6 million in funding and the company currently has 11 employees. Sankar started working on the product in 2010 and launched her first small beta tests at Stanford in January 2011. At that time, about 4,000 students used the system. Today, she told me, the service is being used by closer to 250,000 students at universities around the world.